George Randle was born December 14, 1836 in Tennessee. As a boy, he attended school in small log cabins and then from the age of nineteen, he studied medicine at the University of Nashville and practiced in Arkansas and Kentucky during the 1850s. In 1865, he left the Red River in Arkansas and came to Texas where he purchased some land ten miles north of Waco and began farming cotton while establishing himself as a trustworthy doctor in town. Eventually, his cotton production grew so large that he had to abandon his medical practice in 1869. G.H. 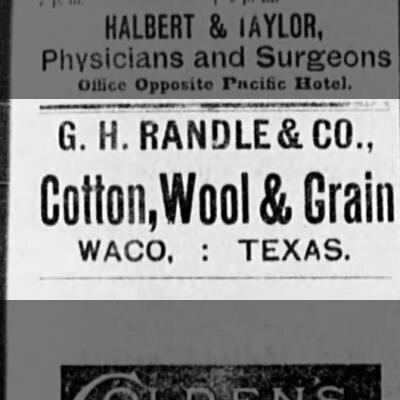 Randle & Co. grew so large that it turned out more than 50,000 bales of cotton each year and was a nationally recognized company. He also was a director of the Provident National Bank in Waco, owner of Waco Compress, director of Blake Manufacturing, and generally involved in nearly any major business venture of Waco during the 1870s. Randle was a long time member of the Austin Avenue Methodist Church and an active member at Waco 92 and Waco Commandery No. 10. He was buried in 1906 at Oakwood Cemetery.